A damp and chilly Sunday is a perfect day for staying in and catching some football on the tube and warming up with a hot bowl of chowder. I already had homemade veggie stock, leftover sweet corn and fingerling potatoes, so I was halfway finished before I started. Sauté the diced onion and celery in olive oil over low heat. Preheat the veggie stock in a separate pan. When the onions are translucent, add the diced potatoes, sweet corn and half of the veggie stock. Pour the other half of the warm veggie stock into the blender and add the chopped avocado, then blend until smooth (I use a Blendtec on the Smoothie setting). Now pour the avocado stock into the soup and stir until all the ingredients are evenly mixed. Add salt and pepper to taste. Serve immediately with a little chopped parsley or cilantro and Old Bay seasoning sprinkled on top. Also surprising good when chilled. 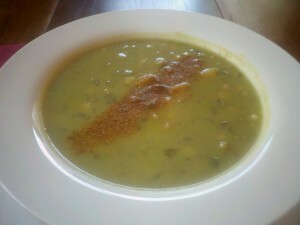 This entry was posted in Gluten-free Recipes, Vegan Recipes and tagged 30 minute recipes, comfort food, vegan. Bookmark the permalink.